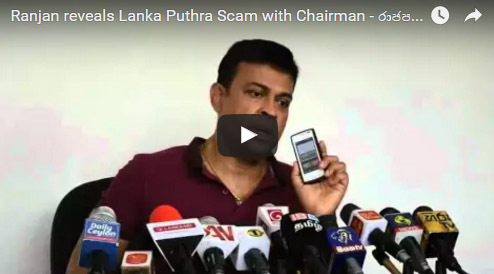 (Lanka-e-News- 23.Feb.2016, 9.00PM) How the state bank- Lankaputra bank was allowed to be robbed without let or hindrance during the Mahinda Rajapakse corrupt brutal reign by his henchmen and lickspittles was revealed at a recent media briefing by minister Ranjan Ramanayake while having the chairman of Lanka putra bank as witness via the phone. It was disclosed that during the corrupt and criminal reign , Rs. 5 billion was released as loans to political henchmen , and out of that sum , Rs. 2 billion could not be recovered. That is the borrowers have defaulted payment with impunity . It is impossible to recover the loans because spurious guarantees have been given. This information is most rudely shocking , it was pointed out. One such borrower has kept a Thiruwana stone stating it is a precious stone and taken the loan . A scoundrel of an actor who did the sordid biddings of Mahinda Rajapakse had taken a loan purportedly to produce a film giving a land as guarantee . But that land which is vulnerable to landslides had been rejected by Valuers on two occasions as worthless . Ultimately , no film too was produced by that culprit. Another UPFA provincial council member had obtained a loan , citing the reason that it is for boat building. In the end no boat was constructed. PC Minister D.T Upul who screamed from the DIG down to the constable of the FCID should be stoned to death had taken a loan from the bank by providing a bogus Temple land as guarantee. The garment businessman Kumar Devapura had taken a loan of Rs. 500 million without any guarantee . He too had not repaid the loan and cheated the bank wholesale.